Mid February, he adds, may sound to some very early to plan. 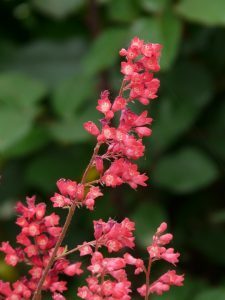 But once robins are singing and trees are budding, the phones at Deck and Patio have been ringing for many weeks with requests for projects. Other key parts of the design/bid process include pulling the right people together for every aspect of the project. Starting early ensures each team will be available at the right time to work in a way that doesn’t slow the job down. 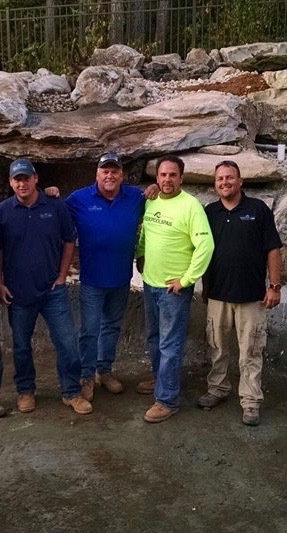 — Will your design/build firm be using subcontractors and if so, are they licensed and insured? Who will be responsible for any repairs during the warranty? — Will your design/builder obtain town codes and zoning information or will you be doing this? 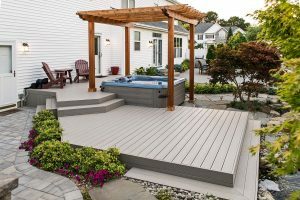 Some firms such as The Deck and Patio Company can introduce you to an expeditor to help in the permit process, if required. — Take the time necessary to verify the references of your designer/builder and how many workers will be on the site at any given time. Will there be a supervisor there, for example. — Review any contracts carefully before signing on. Ensure you have all the warranty information that was promised. 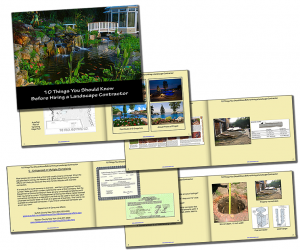 “In fact, there are so many important things to consider early in the process that we have created a booklet, “10 Things You Should Know Before Hiring a Landscape Contractor,” says Dave. Even if there’s snow on the ground, a good design/build firm is able to see underneath it to plan an outdoor retreat. 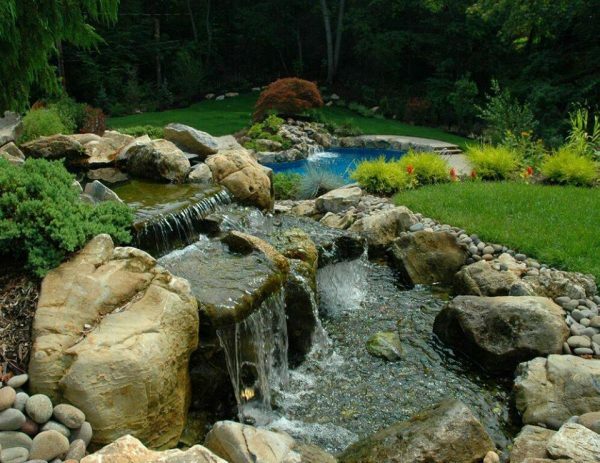 In fact, we built these dual ponds (immediately above) for a client during winter. 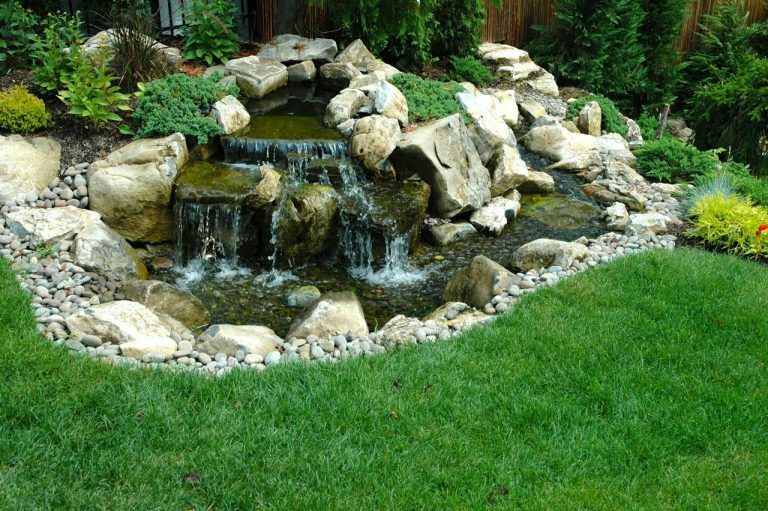 This water feature was designed as an ecosystem pond with a natural-looking moss rock waterfall. It includes a stone bridge. 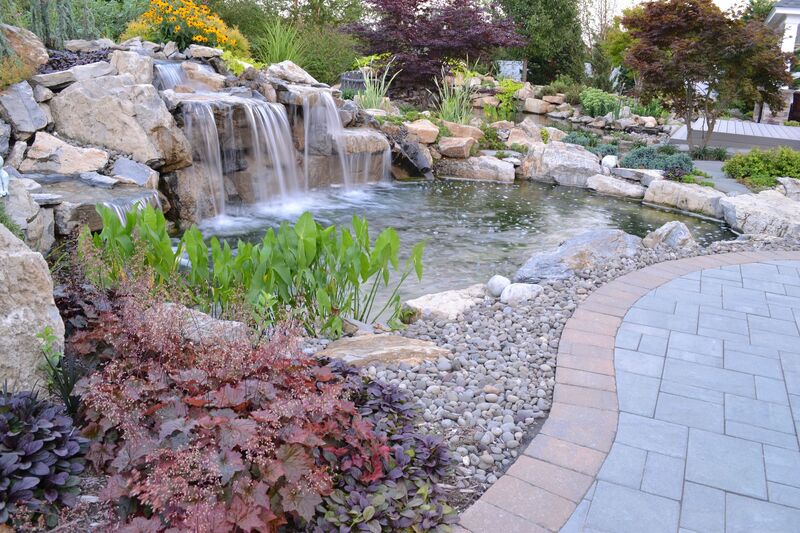 And the stream we added just behind the pond feeds the pond area and boasts an additional waterfall. It is great if your designer/builder can show you through computer animation what your backyard upgrade will look like before you commit to the plan. 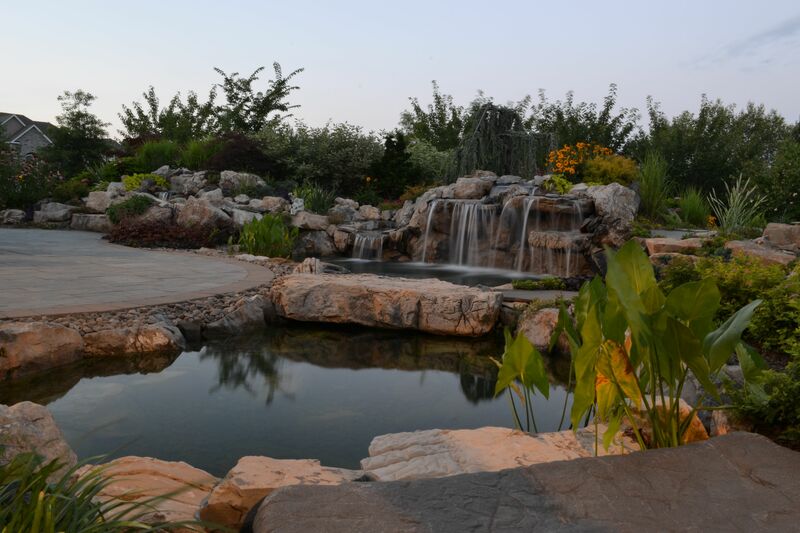 Everything in this project, including the house (unseen here) patio, pool, waterfalls, outdoor kitchen and expanded pond were shown clearly in the animation — even the natural gas campfires. This serenely unique vanishing edge pond belies the challenges (town codes/design planning) that were required to bring it all about. Being located on a bluff on a highly regulated area of Long Island’s north shore (Eaton’s Neck), there were lots of regulations regarding building near the cliff’s edge. Deck and Patio came up with a natural vanishing edge “pond” design instead of a pool which satisfied the code regulations. 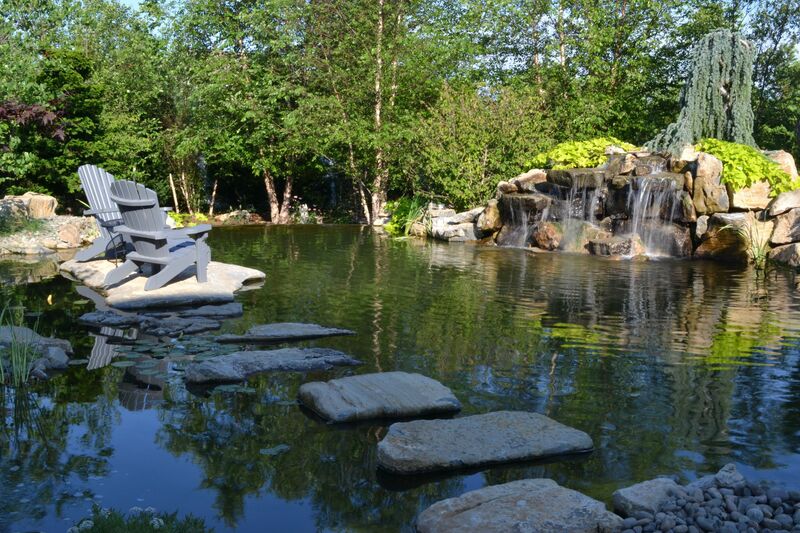 But it took early planning to not only get permits but to also create the pond’s complex natural biological filtration system that maintains the pond’s crystal clear water. 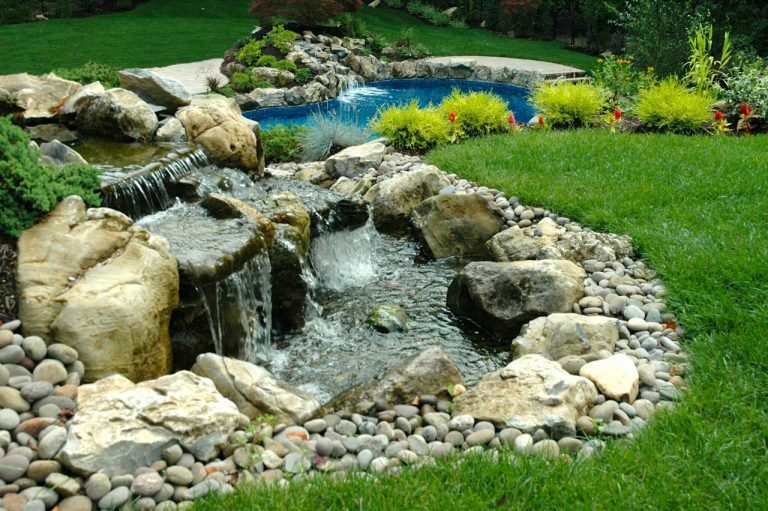 Planning glorious backyard water features takes time, especially if you want a man-made feature like this to appear as if Mother Nature designed it herself. This requires ordering and installing the perfect-sized rocks and boulders that urge the water to flow in natural spills into either a pond or pondless-reservoir. 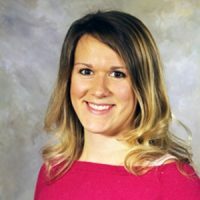 Home is a popular location for celebrating Valentine’s Day. 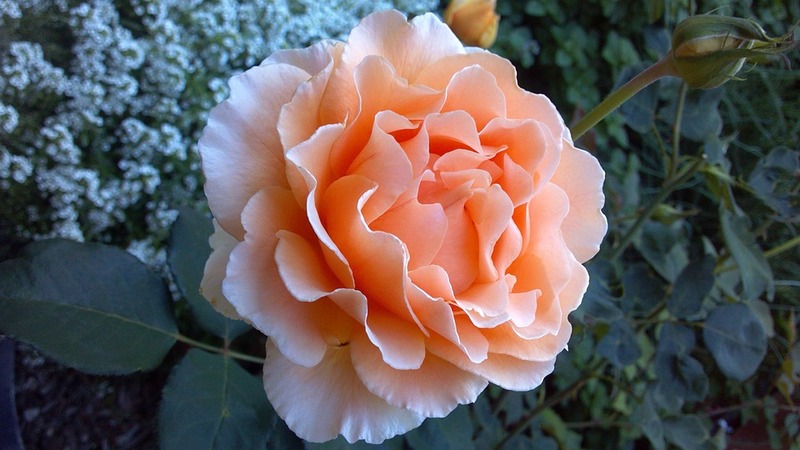 It truly is where the heart is…the center of our strongest affections. 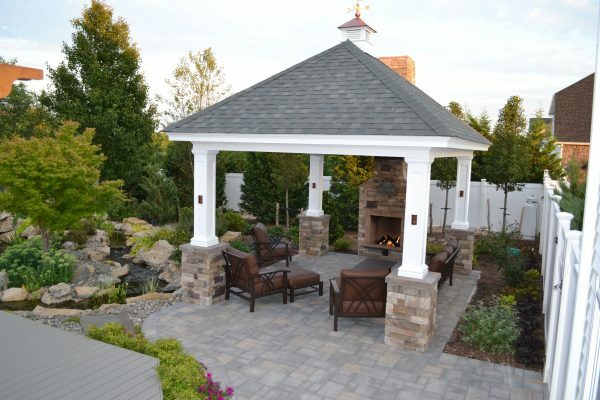 And while February 14th is usually not a great day for outdoor celebrations, it’s a great time to consider how we’ll spend the outdoor living season with our loved ones. Making plans to upgrade one’s property, perhaps including an outdoor oasis, isn’t limited to those who have an ideal backyard terrain. 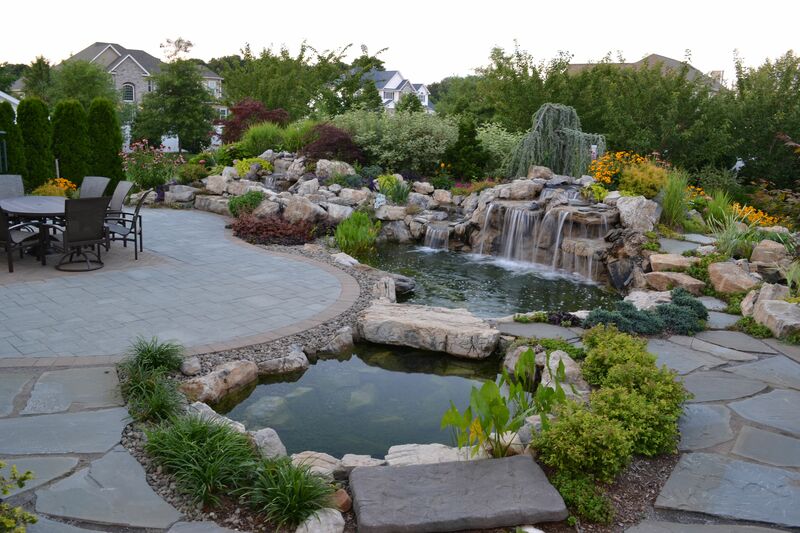 Consider what was accomplished for these Dix Hills’ homeowners. 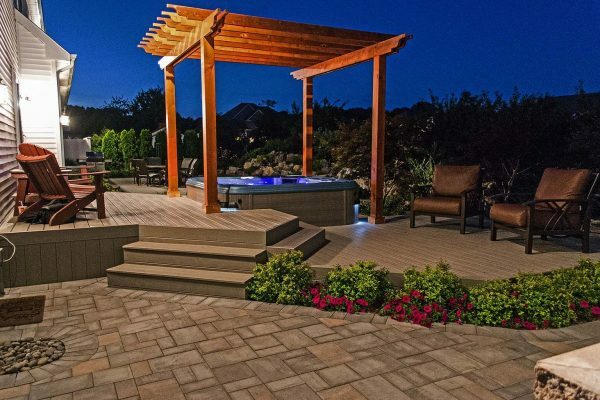 Instead of giving up on their dreams, Deck and Patio showed them how we could take advantage of their property’s steep slope. 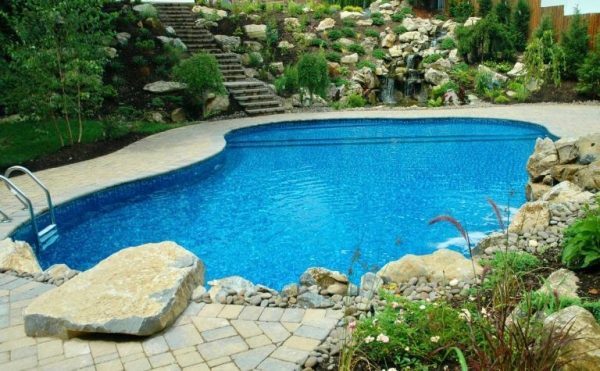 The homeowners wanted a pool, but with the sloping topography they knew any pool would have to be located a distance from the house. 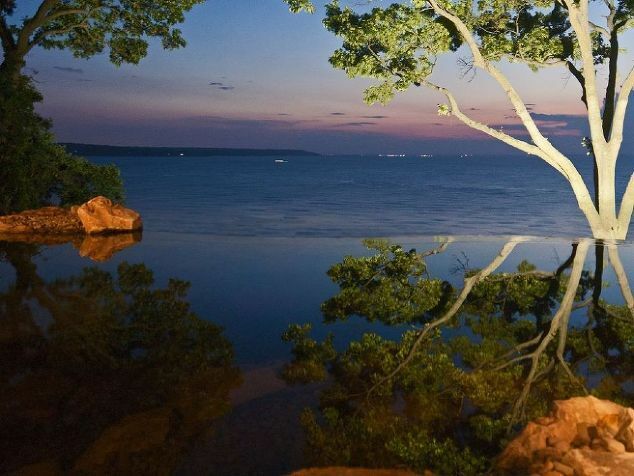 In looking over the property, our team realized that the way to deal with this was to make the to-and-fro — going from the upper patio down to the pool — part of the overall ‘oasis’ experience. So, in addition to the pool and pool upper patio areas, we added a beautiful stream with multiple waterfalls, lush plantings, plus a series of stairs and landing areas, to make the waling an experience in itself. Of course, once the idea of water features was decided on, the homeowners felt it would be a real loss if such a delightful feature couldn’t also be enjoyed up the hill, from the patio near the house. Would they have to be down at the pool to enjoy it all? Deck and Patio’s solution was to add an additional waterfall at the top of the slope that faced the house-kitchen area. That way, they could see a waterfall, as well as the beginning of the stream from there. And just beyond that vantage point, the stream would take an abrupt U-turn, and flow down through five separate cascades, before ending in the lower area pond. 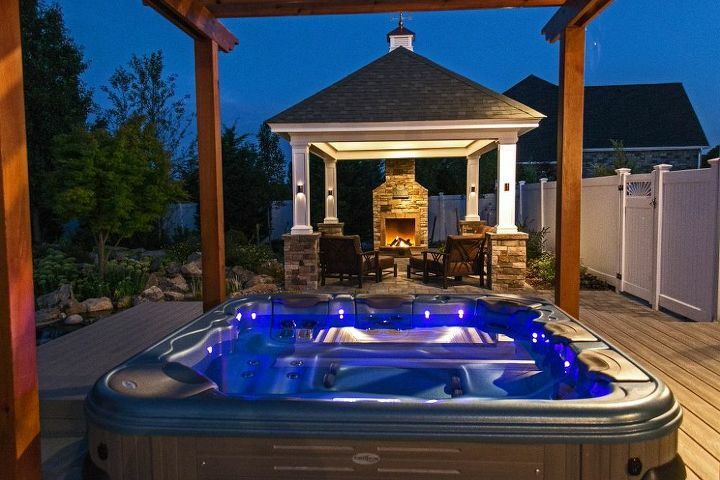 In order to make such a destination pool practical, the overall design plans included an outdoor kitchen, bathroom, living room area, and changing rooms etc. 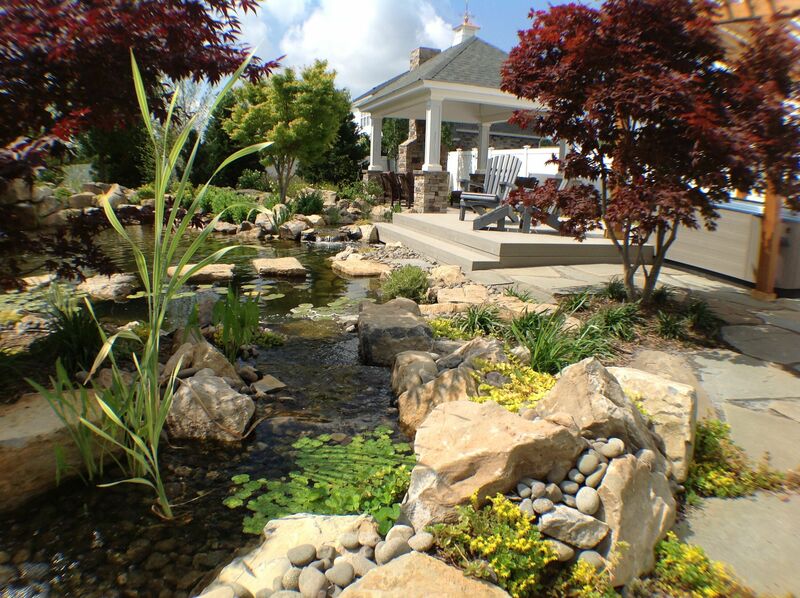 We added beautiful creeping ground cover and natural boulders. 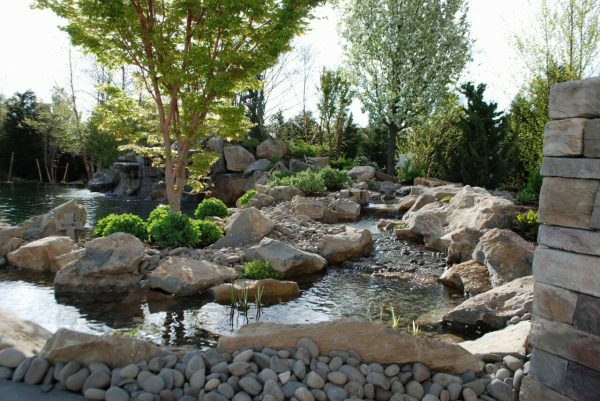 By installing enough retaining boulders and plant materials, Mother Nature’s own gravity coaxes water naturally over rock etc. into a pond near the shallow end of the pool. 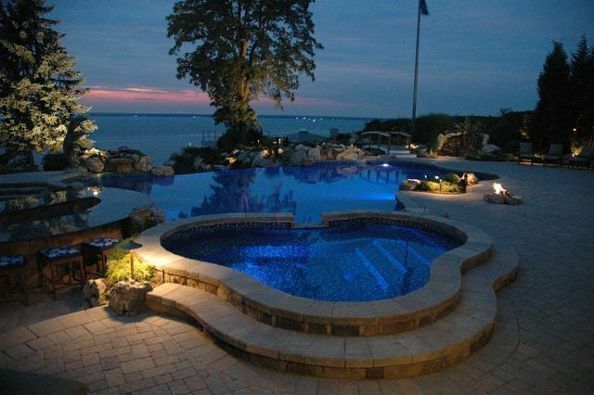 At the deep end, a raised patio area holds a natural stone diving rock. Near it, another tiered part of the patio gives way to a pool-waterfall that flows over natural stone boulders and green ground cover. The result is a Valentine to whole the family. Home truly is where the heart is. 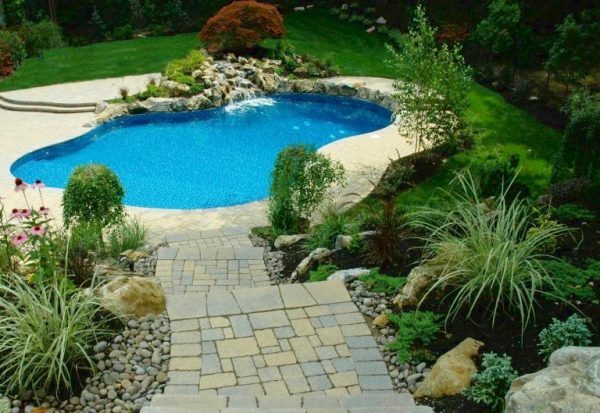 The walk from the house down to the pool is as much a part of the overall backyard oasis as the pool. Beautiful plantings flank on either side of the walk. An additional natural looking waterfall, falling over the edge of the swimming pool, draws the eye forward as you stroll. 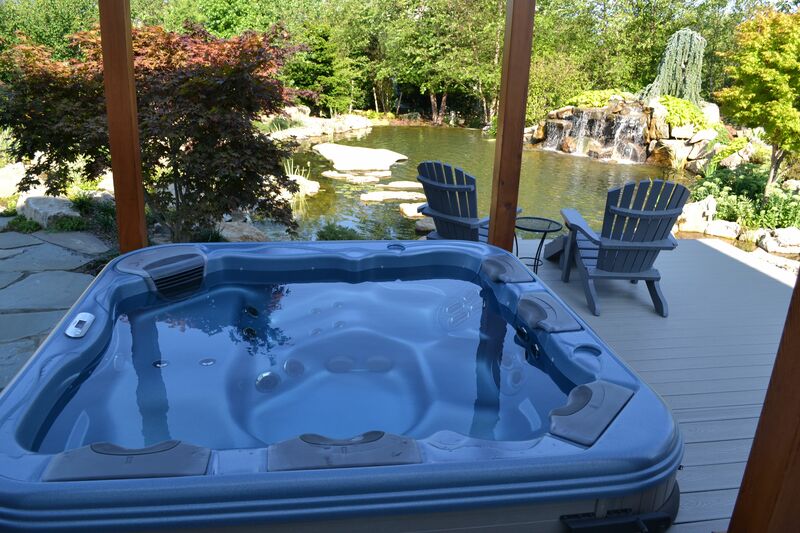 Also note how comfortably large the pool surround is for family time spent by the pool, as well as for entertaining. Our vision was to take advantage of the steep property grade to create a beautiful slope with five cascading waterfalls, moss rock boulders, evergreens, perennials and annuals. Deck and Patio created a series of stairs and landings to captivate family and friends on their journey down to the new lower pool area. Rich plantings and river rock plus moss boulders line the path. 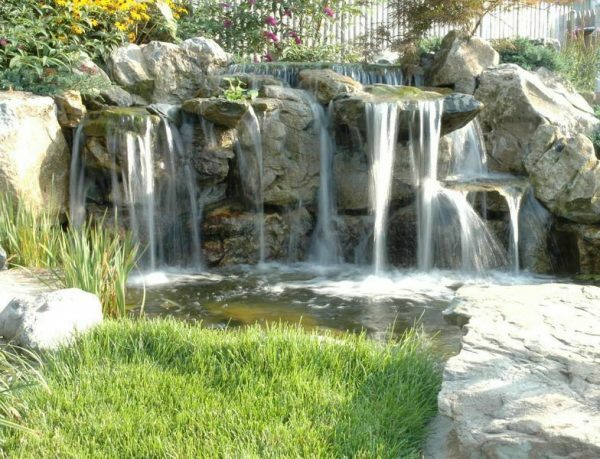 We ended up creating an additional waterfall at the top of the slope that faced the house-kitchen area. That way, the family could see a waterfall and the beginning of the stream; slightly beyond that vantage point, the stream takes an abrupt U-turn, and flows down through five separate cascades before ending in the lower area pond. In Pennsylvania recently, the legendary groundhog, Punxsutawney Phil, predicted an early spring. And we thought fellow gardeners and outdoor living aficionados would find this to be a great time to plan summer gardens and landscapes. 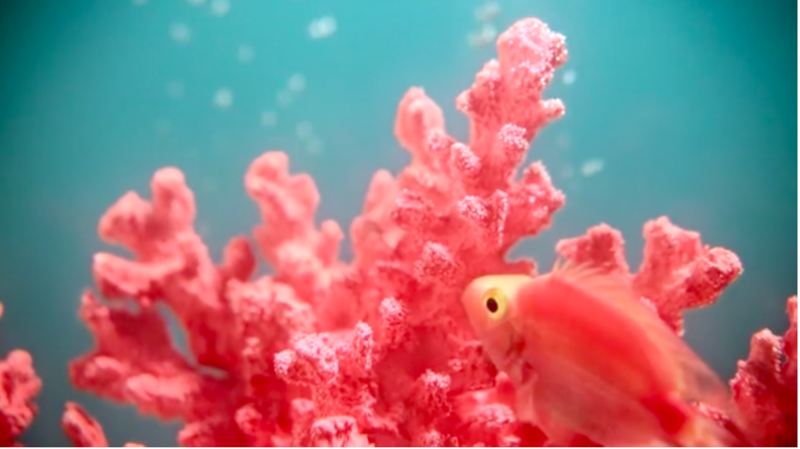 Pantone sees this hue as “animating and life-affirming” and we agree that Living Coral will inspire in any garden. 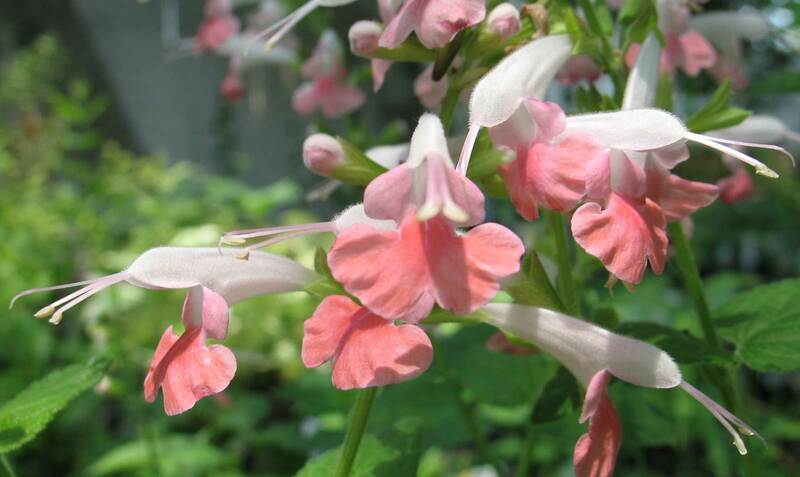 To bring you some expert advice on plants that will offer that uplifting color, we spoke with our good friend, Sandra Vultaggio, Horticulture Consultant at Suffolk County’s Cornell Cooperative Extension’s Diagnostic Lab, and she has some great ideas for our part of the Northeast. Her comments on plant ideas follow. Heuchera ‘Marmalade’: Beautiful coral-orange-pink Coral Bells will pop in a partially shaded garden. 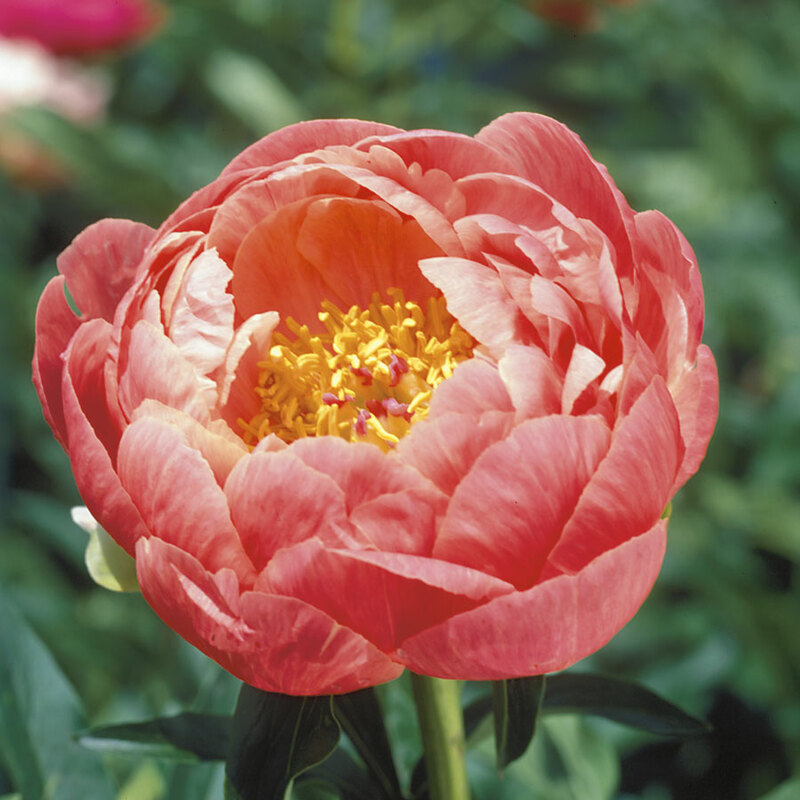 ‘Coral Charm’ Peony: Add some variety to the pink and white fluffy peonies of spring with this peachy-coral peony with a bright golden center. Peonies grow well in full sun and are deer resistant. 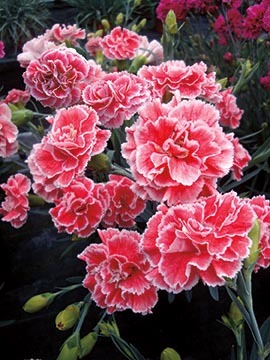 Dianthus ‘Coral Reef’: Grassy, grey-green, evergreen mounds of foliage are topped with bright, cheery and fragrant coral-pink flowers with white edges. 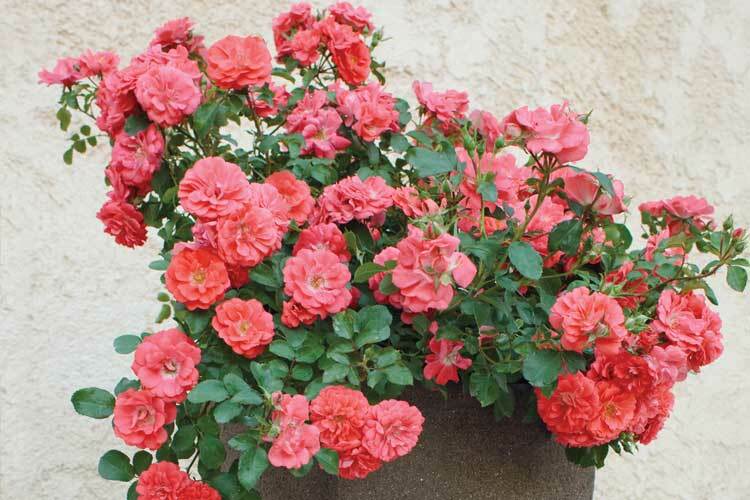 Begins blooming in spring and will repeat throughout the growing season. 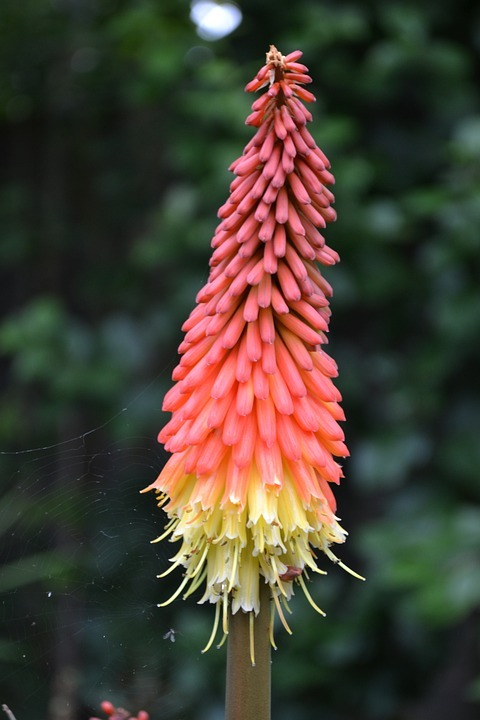 This perennial is deer resistant too. We’d like to Sandra V. For her ideas today. 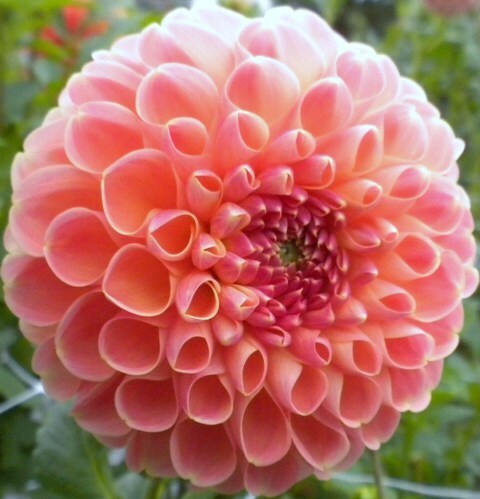 In addition, Deck and Patio has a few other delightful plants to suggest: the Kniphofia Red-hot Popsicle, the gorgeous Dahlia, and the Coral Rose (shown below) which also fare very well in the Northeast. The pièce de résistance: a delicate Coral Rose.